As long as you have some patience, then using the Olympus Tough TG-3 is a delight. It's responsive, versatile and durable. We took it to many events from gigs to days out at the beach and it coped with all of them. The patience comes with the frustrations we discovered. For example, putting a memory card in will frequently knock the protective catch down the card making it write protected. You have to take it out to slide it back up again. That's not too much of an issue until you've done it a couple of times a week. The other issue is that to make the camera extra water tight, there's a double lock on the battery door where the memory card is stored, so you have to undo it twice then redo it twice. We're pleased with the pictures that the Olympus Tough TG-3 took and how sharp they are. We did keep getting a mysterious pale spot in the centre of some images, for example the ISO test shots and we couldn't find a way round it. It could be lens flare, but we also couldn't purposefully reproduce it. Build quality is to a high standard. Olympus have included some nice little touches to make the Tough TG-3 a more attractive camera than other major players, such as Nikon and Panasonic. The e.compass, GPS and wifi makes it an attractive camera to users looking for adventure. Couple that with the obvious tough exterior and it's a camera for all situations. However, it's kind of let down at the last hurdle by the charging system which is unnecessarily large. 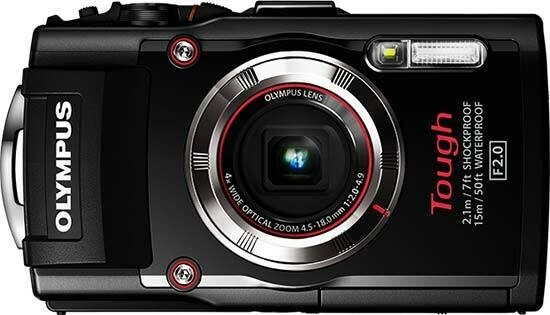 The Olympus Tough TG-3 is an expensive camera, for a point and shooter, but it's an investment over an impulse purchase or something just for occasional use. It's an intensive use camera designed for a lot of picture taking on extensive holidays and trips. If you're about to embark on an adventure and need a camera that can cope with a lot of abuse in extreme situations, then take a look at the Olympus Tough TG-3.